FIFE, Scotland -- A scant six miles down the coast from the most revered links in the world -- the Old Course at St. Andrews -- lies a golf course that many believe will one day dominate the links landscape: Kingsbarns Golf Links. Despite the fact that the layout is still in its infancy, having just opened in July of 2000, Kingsbarns has been heralded as the last great links property available for development in Scotland, an end-all of Scottish links golf. Upon seeing Kingsbarns for the first time, even the likes of the Captain of the Royal & Ancient Golf Club found himself at a bit of a loss: "Mere words cannot convey just how extraordinary the place is. It must be seen to be believed. And once seen, it will never be forgotten." In its first two years, Kingsbarns has been named Best New International Course (2000) by Golf Digest, 46th Best Course in the World (2002) by Golf Magazine, and served as co-host of the Inaugural Dunhill Links Championship (2001, along with The Old Course and Carnoustie). Any further listing of accolades would be superfluous - Kingsbarns is already a "must-play" for those traveling to Scotland to golf. In fact, the course and clubhouse are so scenic, it is worth stopping here to look around even if you do not golf. The Fife Coastal Walkway skirts nearly the entire length of the course, and the gardens at Cambo House are open to the public. (Cambo House is Peter Erskine's family manor, from whom the land for the course has been leased for "only" the next 196 years - so hurry!). It would be wrong to assume that just because Kingsbarns is still a baby, it has no historical interest, that it is simply a callow upstart elbowing itself into the venerable company surrounding St. Andrews. The fact is, golf has been played at Kingsbarns since at least 1793, according to golf historian Bobby Burnet. At that time, a nine-hole course ran through part of the property that the present-day links occupy. Today's 6th, 7th, 16th, and 17th holes incorporate parts of the original layout. During construction of the course, other ancient surprises were also unearthed, including a meandering burn dating from at least the 1600s, and a bridge built of hewn stone some 300 years ago by French POWs from the Napoleonic Wars. Both of these memorable, yet here-to-for forgotten features were accidentally unearthed by bulldozers during the course construction. The par-72 Kingsbarns was designed by (gasp!) American Kyle Phillips, in consultation with co-owner Mark Parsinen, who is one of the only owner/designer/developers in golf. And although the breathtaking visual spectacle of the design - which encompasses the sea on every hole - leaves most visitors "gobsmacked," the fact is that Phillips and Parsinan's labors are as much responsible as Nature herself. According to David Scott, who holds the enviable position of Director of Golf at this picture-perfect course, in excess of 300,000 cubic yards of earth were moved to create the bunkers, dunes, and exquisitely rumpled fairways. Phillips and Parsinan traveled to Royal Dornoch, Aberdeen, and other hallowed grounds to photograph and study the landforms so that Kingsbarns would not appear forced or contrived. The effect is, in a word, brilliant. It is almost impossible to believe that the land has not been in its current form for centuries. The views of distant Carnoustie across the Tay Estuary and of Muirfield in the opposite direction, and of Crail's Balcomie Links further down the coast, make you feel as if this course is no younger than these other sacred tracks. The design is also consistent with traditional links layouts, just a fair bit longer than most at 7,126 yards from the tips. David Scott relates the philosophy behind the design: "Mark Parsinan has played The Old Course some 150 times, and Carnoustie at least 50. He says that without a doubt, at the end of his 150 rounds at The Old course, people come off smiling. At Carnoustie, people sometimes come off unhappy because they have been beaten up by the course." Parsinan and Phillips both want golfers to have fun at Kingsbarns. "The course should elicit anticipation and hopefulness in players of all skill levels," Parsinan has written. Choices abound, and truly punishing features are few. Risk-reward is the mantra, along with course knowledge. Caddies are highly recommended. "Caddies make a huge difference," Scott explains. "If you come in from the risk-reward line, the contours work for you. From the bailout line, contours work against you." Indeed, Parsinan believes that aggressive drive lines should be rewarded with angles and green contours that release toward the hole or are easier to gauge in terms of yardage and wind. Safe driving lines should result in tougher, harder to judge approaches over gaping bunkers and mystifying undulations, and through vexing windbreaks. It is only on the generally deep but narrow greens where Kingsbarns' youth is revealed: The root systems of the fine fescue/bent grass greens are still wispy, with as much sand as grass. Nevertheless, putts run truer here than on many fescue greens (at least for this Yank accustomed to bent grass). David Scott bemoans the last two years' cold weather, which has hindered turf growth. "But we halt play from December to April to give the turf a rest, and we are bringing it along naturally, with little by way of artificial fertilizer." Greens are large, in order to be manageable in windy conditions, and the contouring found on them is not, for the most part, severe. Subtlety is the theme, with more pronounced undulations serving more to visually intimidate and delineate tiers than anything else. My caddie, Kenny Park, read eight putts exactly opposite to how I had read them. He, of course, was correct. The topography of Kingsbarns creates an amphitheater effect. 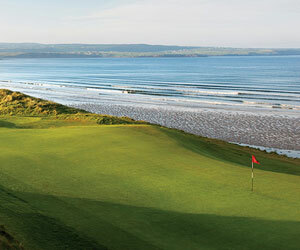 More than half of the holes border the sea, and the others offer majestic views of the surf and craggy shoreline. The golfing experience can be almost religious, especially on crystal clear days. When it's "blowin' a hoolie" and the sea is spitting all day in your face, the course remains relatively playable, with every green but the 18th offering run-up ramps. The 516-yard, par-5 No. 3 is the shortest of the par-5s, and it crystallizes the risk-reward nature of the design. The fairway is narrow, but it generally plays downwind. An aggressive drive may find its way into a deep "whin" (depression) in the fairway, or end up perfectly level, for a go at the green in two. A massive bunker lies short right of the green - it is a true hazard, unlike most American bunkers these days. No. 12 is Kingsbarns' equal to the 18th at Pebble Beach. At 606 yards from the tips, this behemoth dogleg left hugs the shoreline from tee to green. Taking your drive over the ridge on the right side opens the hole some, but missing right is almost as bad as missing left (at least you can find your ball on the beach). You are rewarded here for playing your second away from the sea as well, but we all know what often happens when our swing thought is "Don't hit it left!" Nos. 17 (474 yards) and 18 (444 yards) are two spectacular long par 4s. No. 17 plays all uphill, with fairway bunkers on either side of the short grass that look as if they resulted from mortar explosions back when the land served as a military exercise ground during WWII. No. 18 plays uphill and then back down, and produces the only forced carry approach shot on the course, over the centuries-old burn and historical stone bridge. Tall fescue hems in the turtle-backed putting surface on all sides as well. If any money hinges on your match, this closing hole could easily ruin you if you get overly aggressive. Approximately 60 percent of all rounds are played at Kingsbarns by Americans, and since the course was designed by Yanks, golfers will find some characteristically American features. The routing actually takes you back to the clubhouse between Nos. 9 and 10, a rarity on links courses. Water stations are located every few holes, and yardages are clearly and liberally marked. Certain administrators with the St. Andrews Links Trust find it "a bit cheeky" that the newcomer Kingsbarns has set its green fees well above the rate at The Old Course. But David Scott points out that Kingsbarns does not have any memberships at all; the course is strictly daily fee, even though the level of service both on the course and in the impeccably stocked and decorated pro shop, clubhouse, and restaurant is easily equal to that at any private golfing clubhouse in Scotland. And the higher green fees make this possible. The spellbinding course and first-class service have not only drawn acclaim, but have also drawn an acclaimed list of golfers, all of whom make Kingsbarns one of their main stops while in Scotland. My caddie, Kenny Park, had caddied for Michael Douglas and Catherine Zeta-Jones, Dan Marino, and the fathers of Ernie Els and Sam Torrance. As popular as Kingsbarns already is (local word is that tee times are already difficult to obtain, unless you're Catherine Zeta-Jones, of course), the remaining 196 years on the land lease seems far too short. After all, you're going to want your great-great-great grandkids to golf here. They'll need to see it for themselves before they'll believe the stories you tell of these soon-to-be legendary links.